Founding chief executive of Philadelphia’s Center City District will accept the award for his achievements in the revitalization of the city. Philadelphia Hospitality will honor Paul R. Levy with the 2017 Vision for Philadelphia Award on Monday, October 23, 2017 at the Union League of Philadelphia. The Vision for Philadelphia Award recognizes a leader or organization that plays a preeminent role in advancing the Philadelphia region – whose energies focus attention on the City’s assets and whose leadership impacts the quality of life of our region’s citizens and business community. Levy’s achievements in civic leadership, urban transformation and revitalization benefiting Center City are right in line with the core values of the Vision for Philadelphia Award. In 1991 Levy founded the Center City District (CCD) and has served as chief executive director since its inception. Safety and cleanliness were the main focus of the management group in its first days before expanding into marketing, promotion, planning and capital improvement services for central business districts. 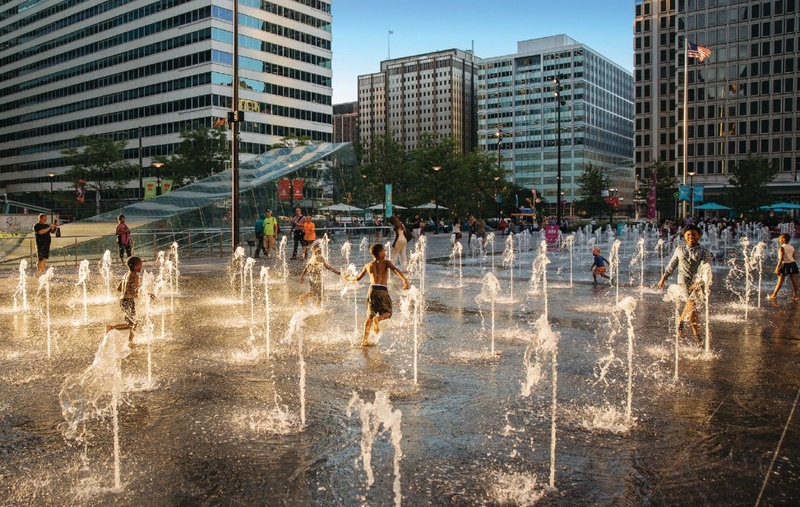 He helped improve the streetscape with planters along Broad Street, lighting along Benjamin Franklin Parkway, and building facades, but perhaps Levy’s greatest achievement to date is the $55 million renovation of Dilworth Plaza into Dilworth Park, a civic gathering space that includes a gateway to a central transportation hub. Levy is also credited for Sister Cities Park, and the newest project, the Rail Park. According to the Visit Philadelphia annual report Center City, as well as the Greater Philadelphia Region, saw a 2.4% increase in visitors from 2015 with a total of 46 million. These visitors generated an astounding $11 billion in economic impact, according to the report, and supported 96,600 jobs. Philadelphia has also flourished in employment. According to Center City District’s annual State of Center City Report for 2017, Philadelphia is currently benefiting from an eleven year positive job growth, adding around 40,000 jobs, 16,000 of those jobs being added in 2016 alone. With an increase of 2.4%, Philadelphia is surpassing much of the nation in job growth. Center City Philadelphia holds 42% of all Philadelphia jobs, which is also assisting in the increase of residents living in the Philadelphia area. Levy recently rolled out a new marketing initiative aimed at increasing shopping in Center City. The initiative is called This is In, as in Center City. The campaign will be unveiled through print, transit, online and interactive media. Levy also serves as executive director of Central Philadelphia Development Corporation, an advocacy and planning organization supported by the downtown business community, whose recent initiatives include the development of a master plan for the Benjamin Franklin Parkway and a plan for a comprehensive municipal tax reform that is advancing at the State level. Independence Blue Cross, Brandywine Realty Trust, Pennsylvania Convention Center, SEI, Comcast, Preit and the Philadelphia Residences are all proud to honor Paul Levy as the 2017 Vision for Philadelphia Award Honoree. Philadelphia Hospitality, a private non-profit organization, was created 35 years ago to attract cultural, corporate and professional groups to Philadelphia, and introduce them to the city’s wealth of world-class museums, historical sites, horticultural attractions, and performing arts venues. Their unique programs feature both the public side of Philadelphia through behind-the-scenes tours of the city’s world-renowned cultural and historic treasures and its private side through visits to private homes, art collections and gardens. The organization contributes to the region’s economic development through tourism. Philadelphia Hospitality is known for creating customized itineraries, providing exclusive access and delivering exceptional service. Sign up for sneak peeks on upcoming excursions! Thank Your For Your Response! © Copyright Philadelphia Hospitality Inc.